It is very difficult to suggest itineraries to suit all tastes on something like a website. I have put together few thoughts in my experience on what can be done in a day. It’s up to you to mix n match the days as per your liking. e.g. if you have two days, you can do the first day as per the 1-day itinerary and do the second day as per the 3-day itinerary. Many sites are within central London zone 1, so if you study the sites and tube map together, you can also design your own itinerary to suit your taste. There are many possibilities, so do send me your thoughts on the itinerary you planned and how it went. If you wish, I can add it on the site under user suggested itineraries. Do check the opening and closing times of all sites to decide/change the sequence of visits. My suggestion is to spend at least 5 days in London to decently explore this wonderful city. Glimpses of London day. It’s a pity that you have just one day. However, this is my suggested itinerary to cover all tastes and not taxing you too much physically. I have done this itinerary myself with several of my friends and guests and found it to be liked a lot. Start with Trafalgar square (charing cross station) – There is no better site than coming out of the station into the bustling square. After spending half an hour with the pigeons there, move onto St. James’ Gardens (gardens outside the Buckingham Palace). It is just 5 – 10 minutes walk from there and you can see the main entrance gate from the square. Spend about an hour there enjoying the fresh air and proceed to Buckingham Palace. You can see it from the Garden. You can see the change of guards if you are there at the right time. Facing the palace at the main gate go to your left towards the Westminister. 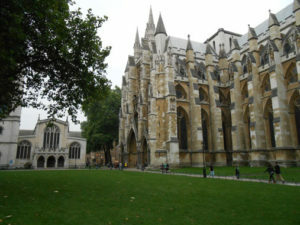 Visit the Church and see the parliament buildings and Big Ben. Incidentally, Big Ben is the bell inside the tower and not the Clock or the tower itself as many think. Over the Bridge on the other side, you can ride the London Eye (if booking available or you have pre-booked) or take a board ride on the Thames. It is about 15:00 now. You come back on the Bridge and go to 10 Downing Street (If you are not aware, this is the Prime Minister’s residence, don’t expect him to call in for a coffee though!). If you decide not to see 10 DS, get a tube from the Westminister station and go to Tower Hill station. See Tower of London from outside and see the famous Tower Bridge. If you want to visit the Tower of London from inside, you can save time at the London Eye/ boat ride stage to reach there before the closing time. You can also do this tour another way round like Tower Bridge / Tower of London -> Trafalgar etc. Museum day. This will be your Museum day. You can do above for day 1 and on day two, you can do Natural History Museum / Science Museum (South Kensington station) which are next to each other. These would be liked by children and adults alike. 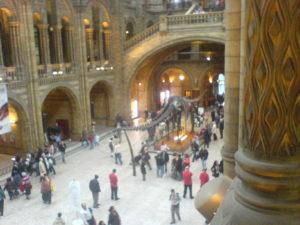 The highlight is the huge Dinasour skeleton at the entrance. You can also see an IMAX film in the Science Museum. The best part is that the museums are free entry on 31 Aug 05. You have to pay for the IMAX. Visitors from the commonwealth may enjoy the next door Victoria & Albert museum. It has the Tipu sultan stuff. This would take a whole day. If you are not a science person and want to visit another history museum, go to the British Museum. Or you can choose to go to the Tate gallery. After museums, if you still have the energy left, you can go to the Leicester square/oxford circus area to relax. Sports day. 2 days as mentioned above. You can start your day at St. Paul’s cathedral. Do first two days as above. You can go to the Lord’s cricket ground and Wimbledon. 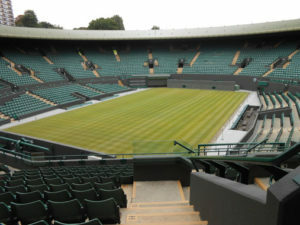 To go to Wimbledon, my suggested way is to go to East Croydon station (zone 6) from London Victoria. It takes about 15 minutes. From East Croydon, you can take a tram (yes, a tram) to Wimbledon (20 mins). Your 6 zone travelcard is valid on this tram. Before going, check on their sites if you would be able to visit (e.g. if there is a match on Lord’s, you would not be able to take the guided tour). If you don’t know what the heck this sports cricket is, its something like baseball – but much better! You can also go to Harrod’s / Selfridges (for window shopping like I do) on this day. You can also go to Hyde Park in the evening. Gardens day. 3 days as mentioned above. 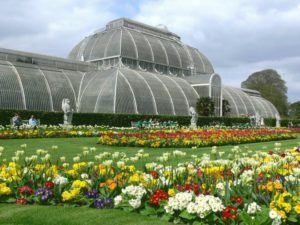 Today, you can choose to go to the Kew gardens for almost the whole day. At the end of the day, you would not have the energy left to do any more sites.